It is very upsetting for a parent to realise that their child is being bullied, but it is even more upsetting for the child, so it is the parent’s responsibility to recognise the signs of bullying. A child that experiences bullying at school is more likely to be anxious as an adult, not reach their career potential and find it hard to build trusting relationships, so it is imperative that any early signs are noted and dealt with. The vast majority of schools have an anti-bullying policy and actively encourage pupils and parents to discuss their fears and experiences, but this can sometimes happen too late. Read the following list of signs of bullying in children and watch for any changes in behaviour in your child so that the problem can be dealt with quickly and effectively. If your child is acting differently at home, whether that’s more aggressively with you or their siblings, or more withdrawn, this can be a sign of bullying. Children that are trying to avoid certain people may change their route to school, or start using a different bus or stop taking their bicycle. If your child starts trying to get out of going to school by regularly saying they are feeling unwell, check when this happens as if, say, it is always on a Thursday morning, they may be trying to avoid bullies. They may also be trying to avoid a certain subject or teacher they find particularly challenging or difficult. A common sign of bullying is when your child often has damaged school books, school bag or school uniform. The odd issue is normal, but when it starts to be more regular it is important to ask how these problems happened, although do not make your child feel bad about the cost implications of replacing the items or they will not feel able to talk to you. As bullies often take lunch money from the children they are bullying, a sign to watch out for is your child asking for more dinner money than usual, especially if they seem to be hungry when they come home from school or do not tell you what they had for lunch. Also be aware of stealing money from home. Bed wetting in older children is a clear sign that they are bothered about something. This often happens in families where major changes, such as divorce, are happening, but it can also be a sign that the child is unhappy at school. This issue must be dealt with very sensitively as the child will often be embarrassed and aware of the hassle of washing and drying sheets, but it is imperative that the parent does not make the child feel bad by making a fuss. I would just like to make a comment about your feature of child bullying, which only seems to mention 'at school'. However I was bullied by my father and somewhat by my brother from a young age and this developed into emotional problems, depression and low self-esteem. 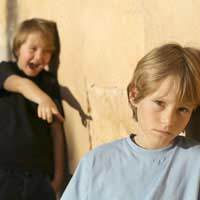 I think some public talks or features should highlight that bullying can be subtle and not always seen as bullying, except sometimes when mentioned by an expert or someone educated in this area.